Should I buy a self cleaning hot tub or swim spa? 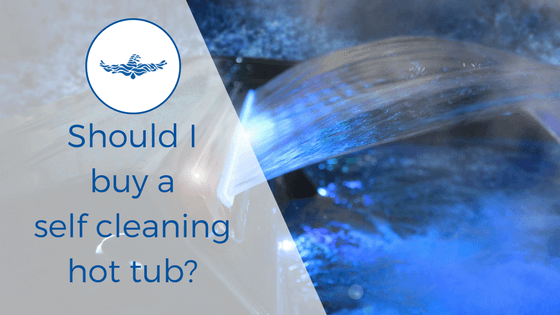 Should I buy a self-cleaning hot tub or swim spa? Clean hot tubs. We’re obsessed with them. And no wonder. Did you know, the average human loses one pint of body fluid in an hour long hot tub sitting. Yuk! I can practically hear the clean freaks of the nation fighting to escape their hot tub. So it’s no wonder that the last few years have seen the rise of self cleaning hot tubs and swim spas. To combat the fears of uncleanliness. And make the experience of owning a hot tub relaxing. And let’s face it. A self cleaning hot tub would be pretty amazing. Imagine never having to worry about hot tub water maintenance. But, what is a self cleaning hot tub? Do you really not have to do ANY maintenance? What is a self-cleaning hot tub or swim spa not? We would really love to tell you that a self cleaning hot tub will do all the work for you. But sadly, a truly self cleaning hot tub or swim spa is the stuff of legends. All hot tubs and swim spas need some work. The only way you’ll never have to worry about hot tub cleaning or maintenance is to pay a professional to do it. Test and adjust the hot tub chemical levels. Clean the hot tub filter. Drain down, clean and refill every few months. At best, a self cleaning hot tub can be thought of as a low maintenance hot tubs. That’s why we hate the term self cleaning. Best case scenario, it’s misleading. And at worst it’s a lie. Sold to trick people into thinking they won’t need to carry out any hot tub maintenance. If you’re looking for something completely maintenance free, then a hot tub probably isn’t going to be for you. But, that doesn’t mean hot tub maintenance has to be hard. Read our posts on how to easily and quickly keep your hot tub or swim spa clean. Hot tub filtration. How clean is your hot tub? Fancy a hot tub or swim spa but have no idea where to start? to find out the 4 things you NEED to know before buying. What is a self-cleaning hot tub or swim spa? The good news is – all hot tubs are technically “self-cleaning”. In that they have built in filtration systems to keep the water clean. But they still need maintenance. But while you are looking for a hot tub or swim spa you’l see the words self cleaning a few times. What are you getting if you buy a self cleaning hot tub? There are a couple of features, that increase the cleanliness of the water. And earn a hot tub or swim spa the name of self cleaning (in some people’s eyes). Hot tub filtration needs to be efficient to capture all the dirt and contaminants so that the water is clean and safe to use. 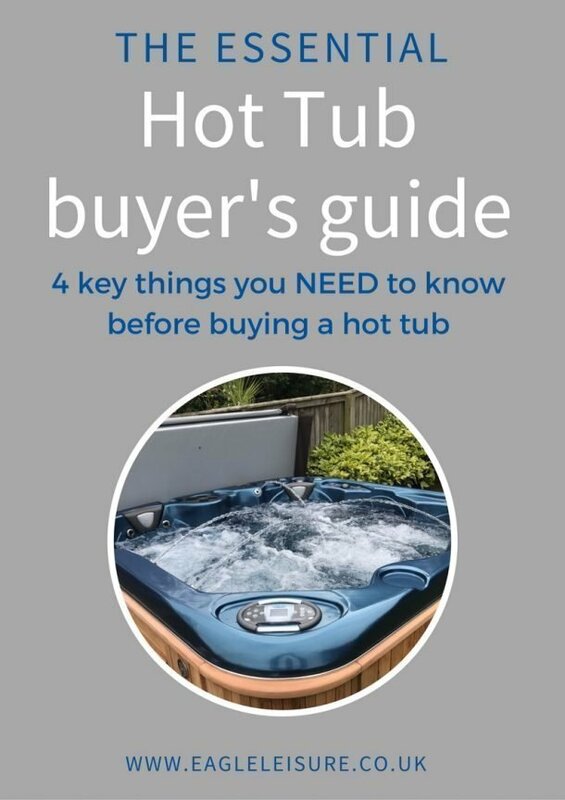 There are a number of ways to ensure that your hot tub is efficient. Pressurised filtration and 24 hour circulation pumps are two ways to improve the efficiency of hot tub filters. But, can we really class efficient filtration as self cleaning? Technically, yes. The hot tub or swim spa passes it’s own water through an efficient filtration system. Effectively cleaning itself. But there is still work needed to keep the hot tub and swim spa water clean. Verdict: No amount of chemicals will compensate for poor filtration. BUT you will still need to clean and maintain the hot tub. Inline/automatic dosing systems are often used in self cleaning hot tubs and swim spas. These sit within the filter or pipework and continually feed the water with chlorine or bromine. Which, is great. As it means there will likely always be a level of sanitiser in the water. However, there is one other important factor necessary for keeping your hot tub clean and safe. Do you know what it is? If you said pH you would be correct. While inline dosing systems offer a steady stream of sanitiser. They don’t account for pH at all. pH plays a really important role in water comfort. Plus an unbalanced pH can affect the effectiveness of the sanitiser. So by not checking and adjusting the pH. Not can you face issues with skin and eye irritation. But you can render the sanitiser that is being fed into the water useless. In addition to inline and automatic dosing systems not accounting for pH. They also don’t test the sanitiser levels. To ensure safe and clean hot tub and swim spa water we would always recommend that you test the sanitiser levels. Not only to make sure there is enough in their to kill the bacteria. But to make sure there isn’t too much. So does an automatic or inline dosing system make your hot tub or swim spa self cleaning? You still have to check the sanitiser level and the pH level. And you will likely still have to add chemicals. So again I would say referring to them as self cleaning is misleading. Verdict: Inline dosing systems are great back-ups or failsafes. But they don’t test or adjust the sanitiser level. And they don’t account for the all important pH at all. Testing and dosing of chemicals will still be required. So, if self cleaning hot tubs and swims spas are a bit of a myth. What are some tried and tested ways that you can reduce the time you need to spend on maintenance? Nothing will reduce the time spent on hot tub and swim spa maintenance as much as good filtration. And no amount of chemicals will be able to offset poor filtration. 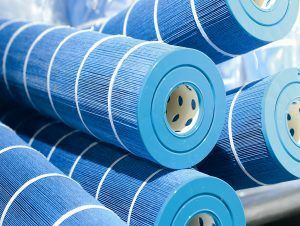 So it’s essential that the efficiency of the filtration is considered during the buying process. Look for a hot tub with pressurised filtration, or 24-hours circulation pump to ensure that the hot tub water is clean and safe. It seems simple. But your hot tub isn’t a bath. Dead skin, fake tan, moisturiser and anything else on your body can clog the filter and affect the clarity and cleanliness of the water. To make your hot tub or swim spa easier to maintain. And to keep your filter cleaner and more efficient. Shower before using your hot tub or swim spa. We still find people are being told Ozone systems or UV systems are primary sanitisation systems. This is not true. 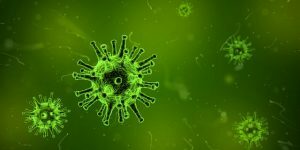 Both ozone and uv systems work within the pipework to help kill of bacteria. They are great secondary sanitisation systems. And they work along side chlorine or bromine to help keep you hot tub and swim spa bacteria free. Installing one of these in your hot tub will help reduce the number of chemicals you have to add. But will not eliminate the need. Do we sell self-cleaning hot tubs? As we’ve said. Technically all hot tubs are self-cleaning. They all have built in filtration that trap dirt and clean the hot tub water. But, they all still require testing and chemicals. And you will still need to drain the hot tub and change the water every three months. Self cleaning hot tubs and swim spas might sound great. But in reality they fall far short of the mark. While they can be considered lower maintenance than some traditional hot tubs. They do still require testing, dosing of chemicals, draining, cleaning a filing on a regular basis. When you’re looking for a hot tub, if you see self cleaning. Please just keep in mind that these will still require maintenance and at this point there is no such thing as maintenance free hot tub. But we can only dream for the future. If you want a hot tub with all the features of a self cleaning hot tub. But none of the BS. Come and visit us. We’re looking forward to it. Thinking about getting a hot tub or a swim spa. But have no idea where to start? for 4 things you NEED to think about before buying.